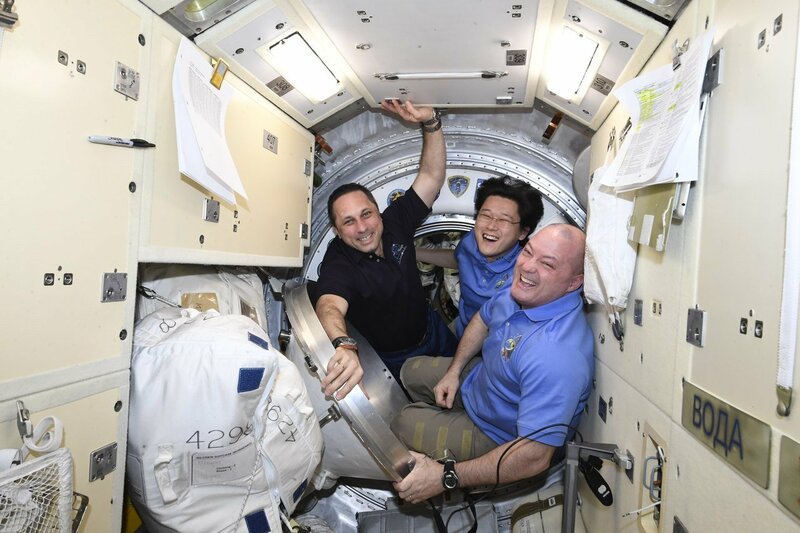 Expedition 55 Flight Engineers Scott Tingle of NASA and Norishige Kanai of the Japan Aerospace Exploration Agency (JAXA) and Anton Shkaplerov of Roscosmos undocked from the International Space Station at 5:16 a.m. EDT to begin their trip home. Deorbit burn is scheduled for approximately 7:47 a.m., with landing in Kazakhstan targeted for 8:40 a.m. (6:40 p.m. Kazakhstan time). NASA TV coverage will resume at 7:15 a.m. for deorbit burn and landing coverage. At the time of undocking, Expedition 56 will begin formally aboard the station, with Commander Drew Feustel of NASA, NASA astronaut Ricky Arnold and Oleg Artemyev of Roscosmos comprising a three-person crew for several days. At the Baikonur Cosmodrome in Kazakhstan, Sergey Prokopyev of Roscosmos, Serena Auñón-Chancellor of NASA and Alexander Gerst of ESA (European Space Agency) are preparing to launch in the Soyuz MS-09 spacecraft Wednesday, June 6, on a two-day journey to dock to the station.